This is my first gas station taco review and it’s a good one. 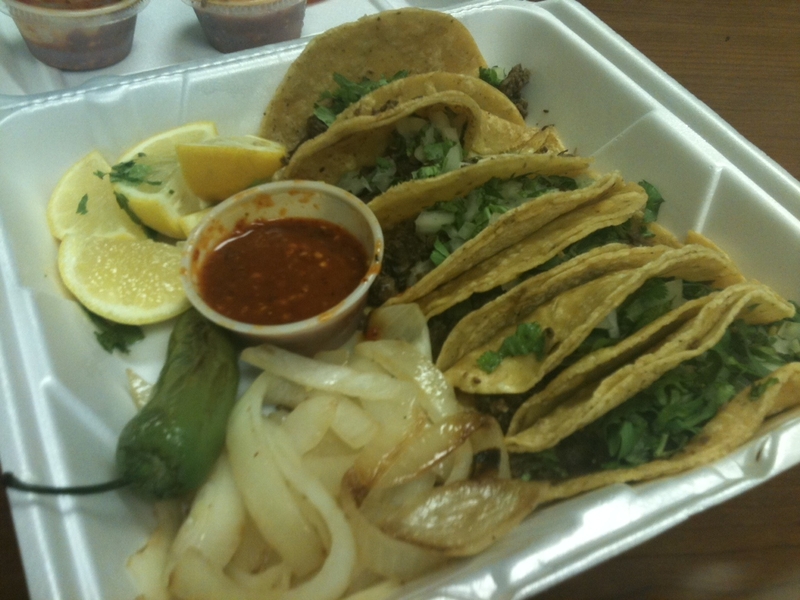 In fact, it is about my personal reigning champ in the taco and fuel stop restaurant category. I’m also sure that those who love the city’s favorite, Fuel City Tacos, will find it a bit surprising that I’m selecting this lesser known location before having shared my thoughts on Fuel City, but don’t worry that review is coming very soon. I can’t recall how I exactly found La Paisanita Taqueria Deli. Sure it’s close to the North Park shopping mall, but it’s not in a particularly great side of the I-75 freeway, nor is it so close to Central Market grocery store that I would’ve naturally stopped here for gas. So I can’t recall how I found it, but that no longer matters because I find myself visiting it quite often when I have a full hour for lunch. Yes, I’ll drive all the way from downtown Dallas to this Chevron gas station for a plate of tacos to go. It usually takes me a good 40 minutes round-trip. So what’s so good about La Paisanita? Is it the atmosphere? Nope since I constantly find myself checking to see if someone stole my car while I wait for my to go order. Is it price? Nope, the prices are typical. Is it a particular meat? Nope, I tend to order the simple fajita meat, while good doesn’t necessarily make the taco. What makes this my favorite place thus far in Dallas is the combination of a few key things. Tortillas: I always order corn wherever I go and La Paisanita uses great tortillas that they liven up on the grill before putting the taco together. Any good Mexican chef knows you need to quickly cook the tortilla to give it some life. A little oil helps a lot. Salsa: They offer two: Green and Red. The red (roja for those of you who remember first year Spanish) salsa is the hotter of the two and has a great, almost creamy texture to it with plenty of red pepper flakes. Sides: Of course I order mine with cilantro, onions and a lemon, but here they also give you a side of grilled onions and a charred jalapeno. Note, I would prefer a lime over a lemon. Together all of this makes for an excellent gas station taco. Plus I find the people here always keep the cook area spotless. So go try it out and please I invite you to steal my current Foursquare mayor-ship, but not my car. I’ve been here a couple of times, but it sounds like I should go back with you. Both times I’ve gone, while the cooks have been super friendly, the service quick and the area very clean, the food has been “meh” for me. I think you’re getting VIP treatment, and I need to know your secret! I do remember the sauce being delicious, now that you point that out. I will try them again, hopefully my first two time were just off days. You can follow me on Twitter at @GasStationTacos. Thanks for reading the blog! I’m going to throw a different slant into this review. Have you ever tried their tortas? It is TO DIE FOR! The bread is incredible and the mixture of ingredients is delicious. They are huge but I would still probably have to stop myself from eating two of them. I haven’t yet had their tacos-I actually enjoy the tacos at the La Tejanita at the corner of Abrams and Park and I’m not ready to branch out yet. I find the man behind the counter at this taqueria to be a really nice guy. I enjoy talking with him and as far as I can tell there is no communication gap. But today when I stopped for my torta in the middle of the afternoon, there was a guy in front getting arrested. It was exciting. He had a bit too much to drink, and he was ready to take on the police. Thank you for the ‘different slant.’ I see so many patrons of this place order the Tortas so I’m not at all surprised by your recommendation. I will definitely have to try one next time and take a break from the tacos. I will however checkout La Tejanita. I love it when people share new gas station taco places with me and have been meaning to try this them out. So thanks for the reminder.